Order within 20hrs 24mins for delivery Monday 22 April using next day delivery at checkout. Smart, good-looking, and tough too. STM's Dux for iPad Air 2 is an attractive smart cover for your iPad, including smart magnet functionality and available in three colours - Black, Blue and Red. The Dux for iPad Air 2 meets or exceed US Department of Defense Standard 810F/G for durability and withstands a drop test of 2 metres. It's constructed from Polycarbonate and rubberized TPU with a polyurethane cover and is ideal for 'difficult' environments like schools, building sites - or even just the more ham-fisted of us. The Dux has magnetic closure and a unique clear back - which apart from looking really cool is ideal for applications like asset tagging, where a barcode can be read without removing the iPad from its case. 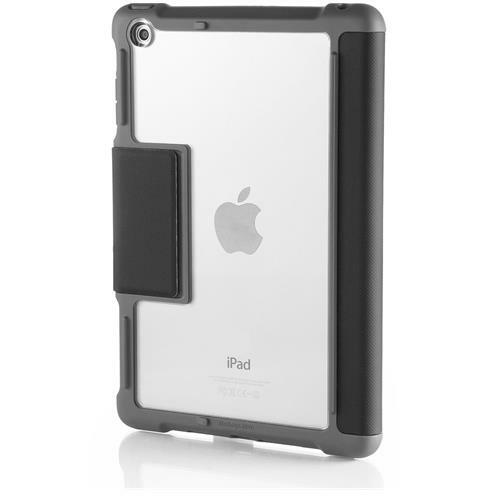 This listing is for the Dux for for iPad Air 2 in Black. Clear back allows custom images, barcode tagging etc.